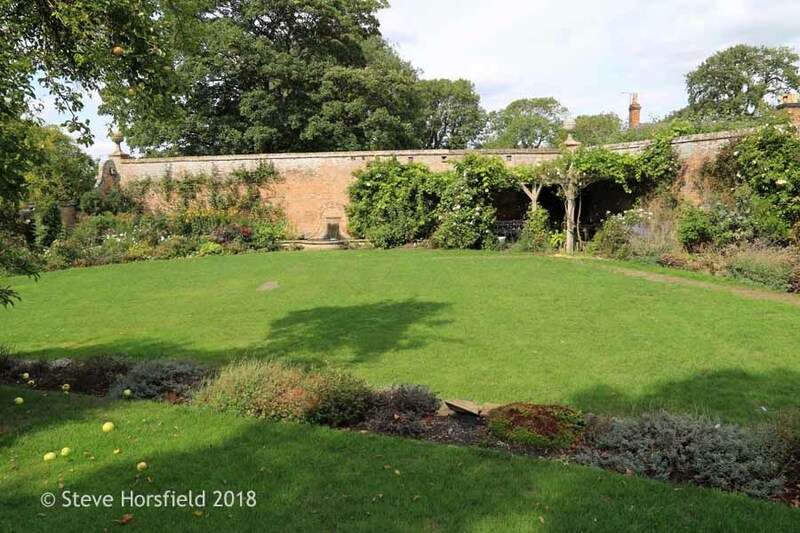 I have gotten behind with blogging about the happenings in my own garden and I would like to catch you up with its development and what I have done from February to mid-March. All photos shown in this post are from this time period. Let's start with the White Garden Bed in the backyard. Not too much white there at the moment, but at least plants are actively starting to grow and green up. I removed a self-seeded hardy geranium located between the small white sculpture and the green mount of a plant to the left which is an alstroemeria. First, this hardy geranium looked so promising, because it was nice, healthy, and grew strongly, but then it turned out that it had insignificantly small flowers and I decided to discard it. 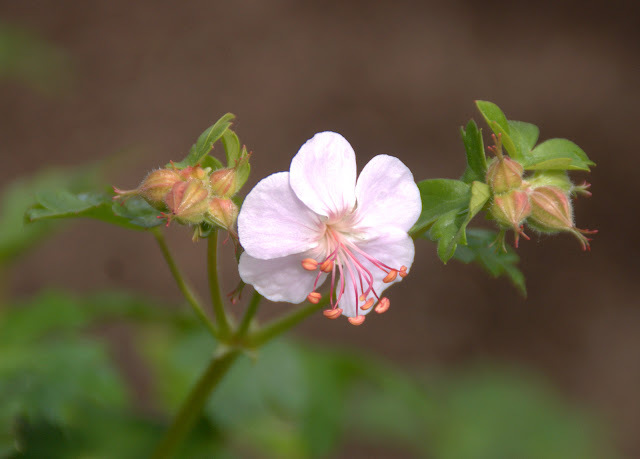 Close-up of a bloom of hardy geranium 'Biokovo'. Somehow I really like this photo! The blooms of 'Biokovo' are a very light and soft pink, but I think they are still acceptable to have in a White Garden Bed. Looking a little bit more to the left of the White Garden Bed. 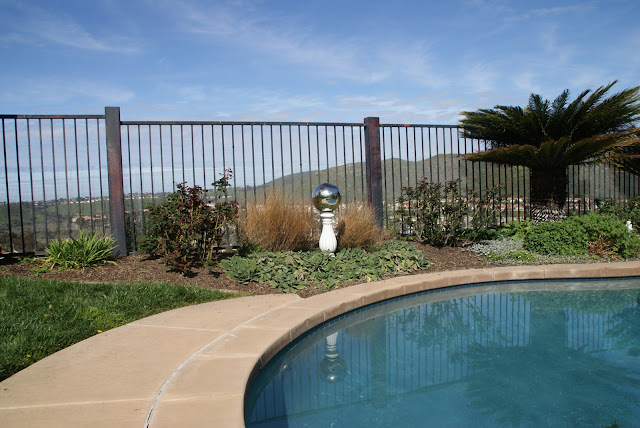 The "brown bushes" that you see behind the white column with the silver gazing ball are the old flower stalks of gaura lindheimeri 'Belleza White' which needed to be cut back. The gaura is new to me since last year and I didn't know at what time to cut it back. Well, I definitely waited too long and next year I certainly won't look at these brown, ugly, and dried up flower stalks that long anymore. All cut back! A little spring clean-up can make such a difference in the garden! Looking to the right side of my backyard. The huge rose that has started to leave out is 'Pierre de Ronsard', one of my most beloved ones. I finally planted rosa 'Charles Darwin' to its right. 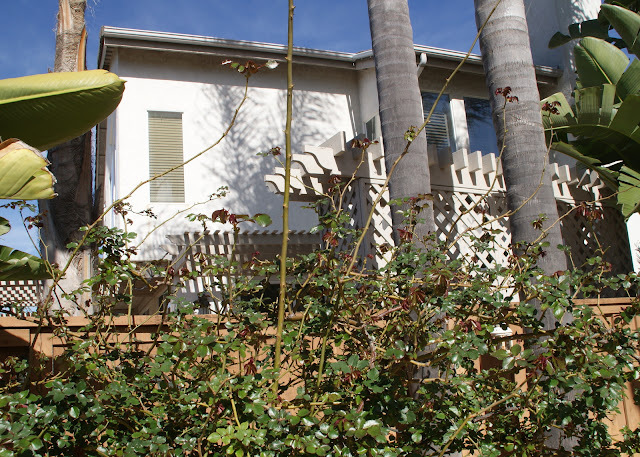 Even though in the photo the new rose looks tiny, in reality, it is not. Both roses are freshly fertilized. 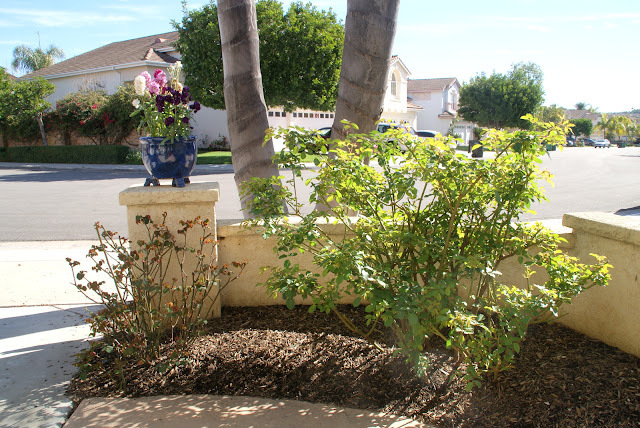 I keep the fertilizer in place by putting some mulch over it, hence the darker color of the soil surrounding the roses. The mulch itself becomes a mild fertilizer for the roses over time. ...if you take a closer look at the longer canes you see that they have trouble to leave out. 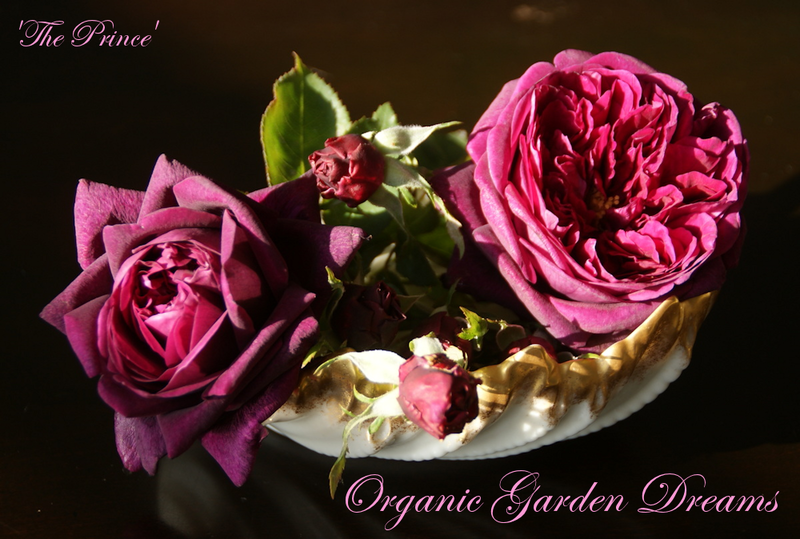 It is high time that the organic fertilizer gets broken down by microorganisms so that it is accessible for the rose. Instead of only showing things that go well in my garden I will also present photos of areas that don't do so great. In the background, you see my calla lilies. They don't seem to like growing in this location. The rose in the foreground is 'Heritage' and also seems to have trouble to leave out properly. This whole bed needs to be fertilized and a good layer of mulch and I bet things will become better. I often struggle to get all the garden chores done timewise. I guess that may sound familiar to some of you. 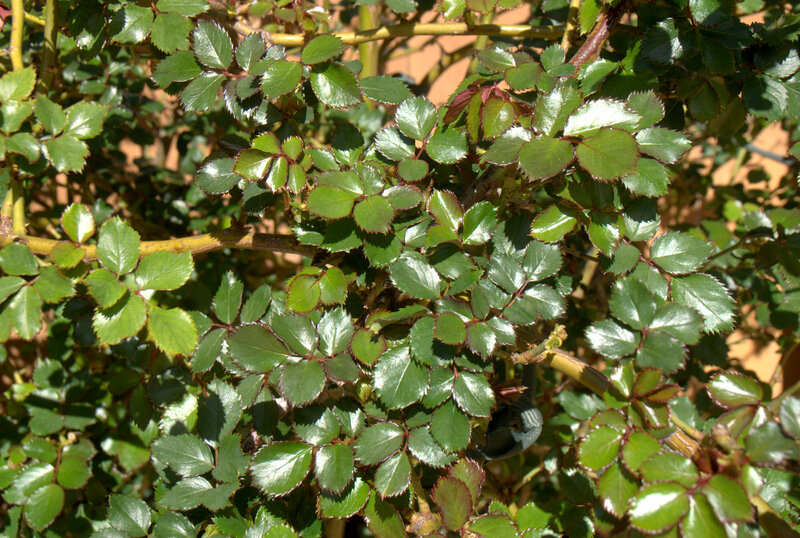 Talking about things that don't go so well: Not all rose leaves are so healthy like the ones of 'Pierre de Ronsard' that I have shown further above. 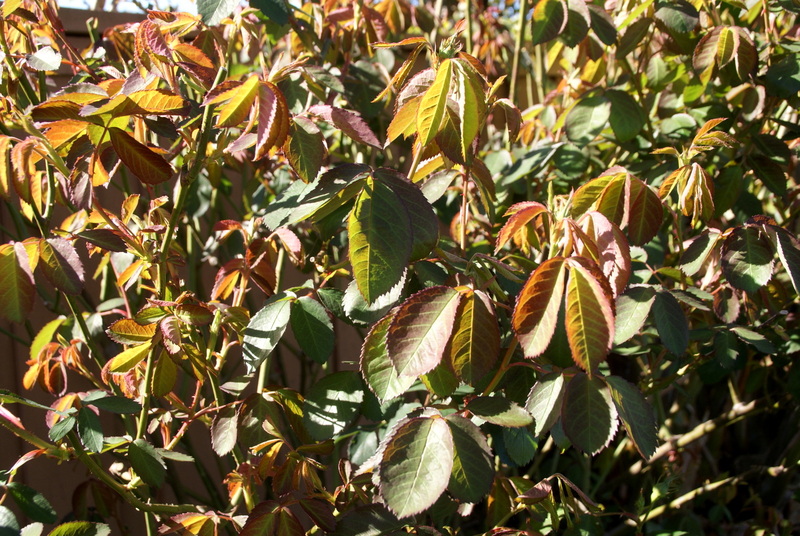 Some roses have responded to the seasonal conditions with lots of rose rust. The leaves above are from rosa 'Bewitched', 'Auckland Metro', and 'Moonstone'. I also see much more blackspot than usual this spring. I believe the increase of both of these rose diseases is due to all the lovely winter rains that we were having. I don't spray and won't do anything about these infected leaves other than pulling them off and/or wait until they fall off by themselves and the roses grow new leaves. 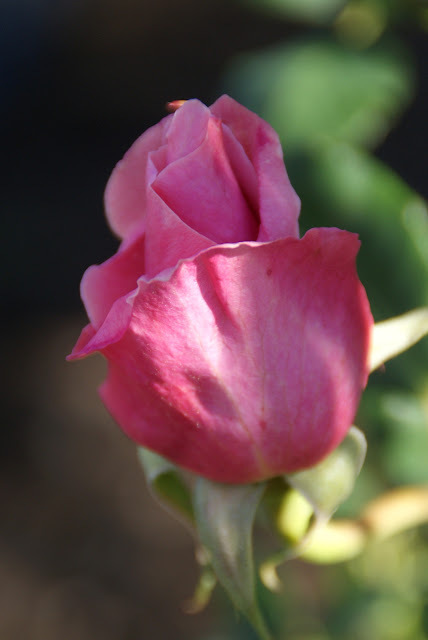 Rose varieties that consistently show very little disease resistance in my garden get eliminated. Here is another wonderful example of healthy rose foliage: These are the new leaves of rosa 'Grandmother's Hat'. This rose has shown exceptional disease resistance in my garden over a couple of years. On a totally different note: I have sown Sweet Peas in February. Probably too late for my climate though, but I just had to give it a try, since I didn't get around to do it earlier. Maybe I am lucky and I see a few blooms before the summer heat sets in. Moving on to the front yard. 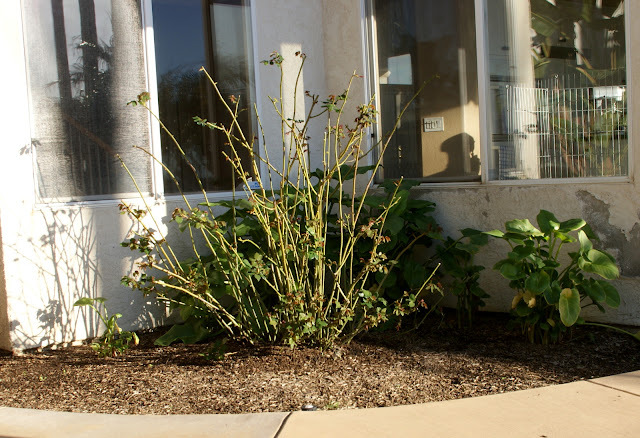 I was going back and forth forever if I should plant another rose between the two existing roses, 'Charles Darwin' to the left and 'Cymbaline' to the right, in this bed or an evergreen plant. Space for roses is scarce in my garden and I always try to plant another rose wherever I can, just because I love them so much, but I think three roses planted in a row would look boring in this area. They would roughly have the same height, the same leaves and in the winter time, I would have to live with three dormant plants. So I decided against it. Initially, this bed was totally flat, but over time I have tried to build a small berm by just putting more and more soil down. The photo doesn't show it well but this bed is slightly elevated by now. 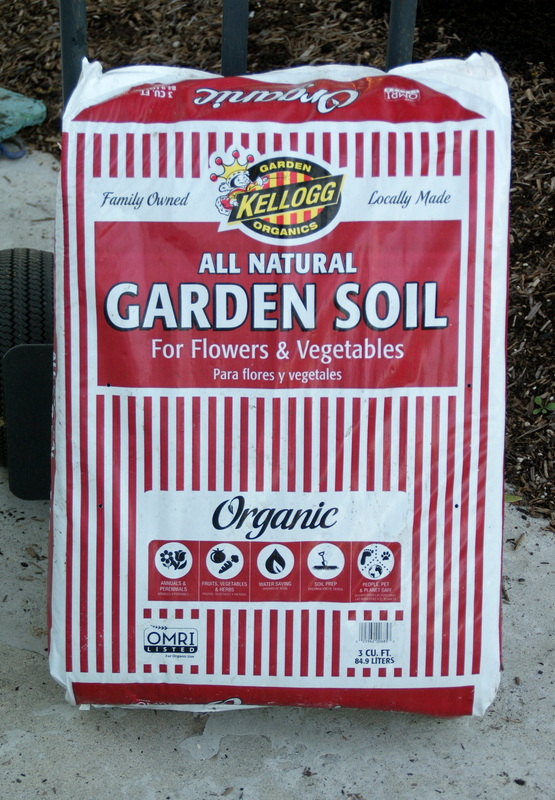 Before I planted anything I dumped another big bale (three cubic feet) of garden soil in the middle of the bed. This is why this part of it looks darker than the rest. I can't tell you how much soil this border has simply "swallowed". The soil just decomposes and raising the level of the area seems to be a Sisyphus work. The evergreen that I decided to go with is this yucca-like, drought tolerant plant that I got from a very nice gardener that I hardly knew on a garden tour and who generously gifted it to me along with five of its siblings a long time ago. The mother plant had formed a nice trunk roughly about the height of the Pygmy Date Palms of my neighbor in the background and that is exactly what I want for this area. 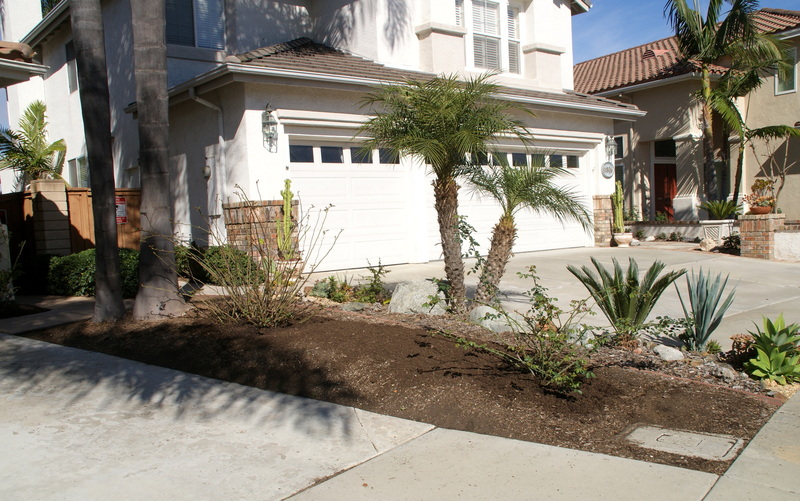 I intend to underplant the yucca-like plant with some flowering perennials to bring color and a little bit of diversity to this bed. And here it is planted in its new home. It still looks tiny but I expect it to grow relatively fast. The gardener who gifted me this plant told me the proper name and I jotted it down on a tiny piece of paper that unfortunately is long lost. Can anyone of you, dear readers, identify this plant? I would be thankful if you would let me know in a comment. Going over to the other side of the front yard my containers of stock are still looking nice and fulfill their purpose of bringing some spring color into the yard, especially when the roses were just leaving out. To the right of the scene in the photo further above is a "problem area" I have been struggling with since we moved into this house: A small strip of soil only about fifteen inches deep. 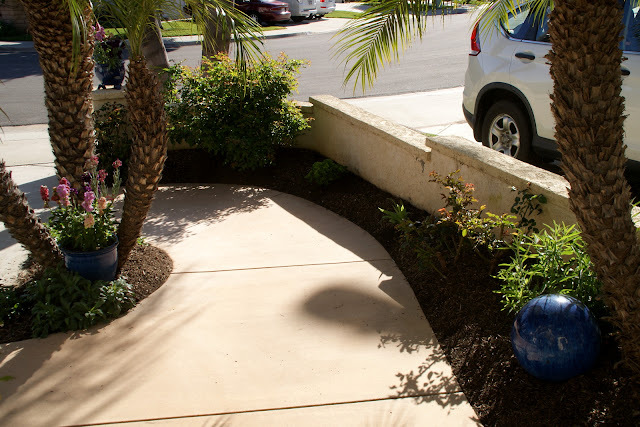 Underneath the soil level, the footing of the decorative wall comes out a couple of inches which makes the growing space for plants even smaller. And as if this weren't enough the whole area is densely rooted through by palm roots from a huge Queen Palm which is planted in the very front of the front yard. You can see the trunk in the photo above this one. No plants have been able to withstand these conditions for a longer period and I am helping myself out here by placing another container filled with beautiful stock. Nonetheless, it is about time to replant this strip. The puny plant to the left is a miniature rose called 'Lavender Crystal', which has very lovely blooms, but isn't vigorous and is suffering from blackspot. I was tempted to throw it away for that reason, but couldn't do it. So I rescued and planted it into a container to see if it would recover if the growing conditions aren't that hostile. To the right, you see the daylily 'Gentle Shepherd' which barely hangs in there, but I hope will recover with a dose of fertilizer, more water, and the sun reaching it a little more as the season progresses. Here you can see the root ball of rosa 'Lavender Crystal'. What was left over once I entangled the palm roots from it is tiny! No wonder the rose wasn't doing well. Stepping a little bit back you can see a wider shot of the area. I planted a Martha Washington geranium 'Regal Elegance Rose Bicolor', which had been outgrowing its container, in place of the rose. Martha Washington geraniums have been pretty tough plants here, which can take a bit of shade and still bloom, so I have hope that this plant will like it here. Here you can see the geranium a bit better! This place is very hard to photograph because of the harsh contrast between sun and shade. In the foreground rosa 'Our Lady of Guadalupe' is leaving out well after a hard pruning this winter but is already suffering from powdery mildew. In one of the next posts, I will show you how I fixed this area. I am quite pleased to say that I found a very nice solution! To end on a rosy note I leave you with a photo of rosa 'Bewitched'. I just love the elegance of her very elongated buds. It turned into a big fragrant flower which I enjoyed cutting for the house. Hope the new week is going well for you and nice warm spring weather is allowing you to be outside. Esta precioso Christina. Buena semana. You are busy! 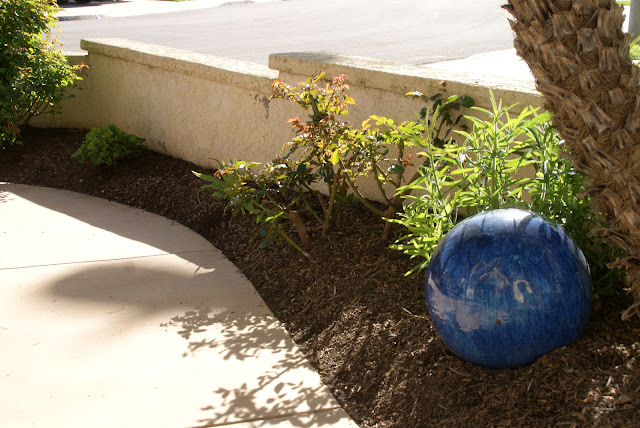 I love garden art and gazing balls are some of my favorite. I also really like Renee's Seeds. Have a fun filled weekend. Great work on your garden. What a beautiful view and pool! 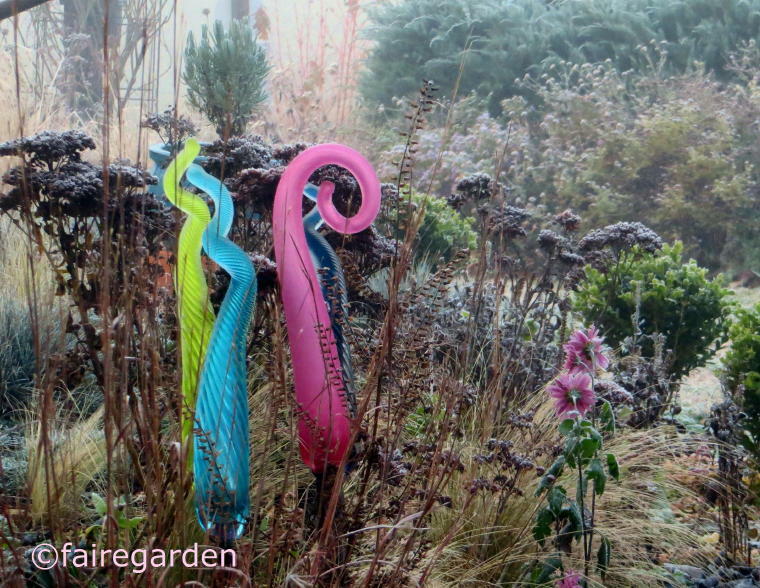 I've been refreshing the garden here too. It's a lot of work, but doesn't it feel good when things are cleaned up and ready for spring? 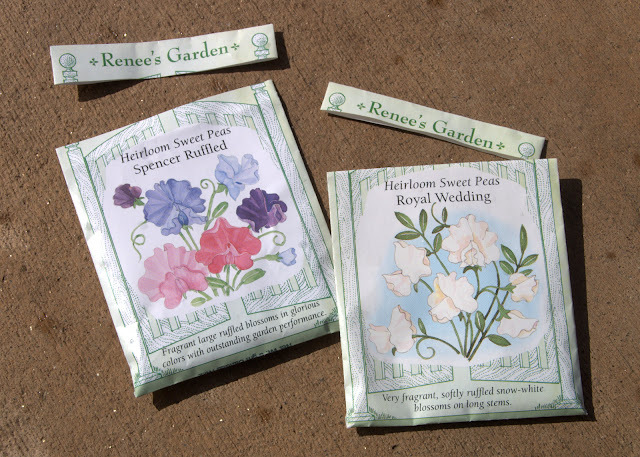 Be sure to show the sweet peas when they bloom. I always think I'm going to plant some, but never do. Sarah, yes, it does feel very good when the spring clean-up is done and the garden is ready again for this wonderful season. I like the color of your geranium. And the rose shoots are really promising. Um den Pool beneide ich dich um Sommer sehr! Kennst du übrigens das noch ziemlich neue Geranium St. Ola? Es soll Biokovo irgendwann ablesen, haben die Gärtner mir gesagt, es ist weiß und wunderschön und wächst dicht und flächig. Erklär mir mal bitte,wie du das meinst, dass ich weniger Gartenbilder zeige? Ich bilde mir immer ein, ich gehe den Menschen mit zu vielen Gartenbildern auf den Nerv, denn das Grundgerüst meines Gartens verändert sich nicht mehr, zur manchmal die Pflanzen? Oder zeige ich zu viele Bücher? What a great, newsy post about your gardens. You have been busy and pretty soon blooms will be 'busting out all over'. You have been very busy in the garden. I wish I could say the same. Maybe later this week. I do like sweet peas and you have inspired me to try them again this year. Barbara, I did put in quite a few gardening hours this year and it was so much fun. I just need to get my hands dirty to feel good :-)! Sweet Peas are wonderful flowers, I am so glad if I have inspired you to grow some. I am sure you will love them! It looks as though you've made good use of our recent stretch of perfect gardening weather, Christina! Gaura self-seeds prolifically in my garden so you may want to watch out for seedlings in your white garden - unless you want a lot more of the plants. Could your yucca-like plant be Beschorneria yuccoides? Kris, so far I didn't find any self-seedlings of the gaura, somehow plants have a very hard time germinating their seeds in my garden. The only one who get this done easily are the weeds :-(. Thanks so much for trying to identify my yucca-like plant. I looked at images of Beschorneria yuccoides, but even though it looks very similar to my plant right now, the mother plant had a trunk that was a couple of feed high, so I don't think this it. Maybe I have to wait a little bit more until it my plant becomes more mature and see what it is turning into. Beautiful gardens. I love all the palm trees. That's one thing I miss about CA. No palm trees in PA. Thanks for sharing at Dishing It & Digging It! Your garden's looking good, Penny! Since April can be unpredictable (snow/frost, anyone? ), the gardening season here usually starts late April/early May. It is exciting to see some greens popping out of the ground! I like your choice of the yucca-like plant between the two roses in the front yard. Problem solving is part of the fun of gardening; it seems I go from one problem to the next! I am way behind on some essential garden chores. I have not fertilized a thing yet, I still have pruning to do, and I am struggling to get ahead of weeds which recently erupted with vengeance. I have crab grass coming up everywhere, not just in the lawn but in garden areas where I have never before seen it. And we still have several dead trees to cut down, a legacy from last year's drought. All great excuses to spend lots of time in the garden. I hope you will be having fun, too! This year I also haven't gotten around to fertilize everything, yet and the garden still survives :-)! Sounds like there is a lot of work waiting in your garden for you, but I hope you take it easy and don't get stressed out if you don't get to everything. I think it is more important that we enjoy our gardens than to always have them in perfect condition. I have been cleaning up in the garden too, now that the weather allowes it. I am also going to sow Sweet Peas, I think they are just beautiful and so is the scent. But I will wait a few weeks before I do it. Christina, I love the way you share what doesn't work as well as what works. Good to know. Your blog must be inspiring me - I've set out to plant some flowers and to weed the back garden, which is going to be a daily task for awhile as we have a gazillion dandelions with their stubborn tap roots. Jean, I try to be "real" about my garden in my blog and show the good, the bad, and the ugly and I glad that you appreciate that. How wonderful that my blog is inspiring you to go out and garden. That makes me sooo... happy. What bigger reward can I get for writing my blog? Weeding dandelions is hard, I know, they are so persistent, but eventually even they will give up. As you said for a while it might be a daily task to go after them. Good luck! Wow, Christina, so much going on in your spring garden. Similar to your calla lilies that don't seem to like their location, I need to transplant our frangipani tree; it just has not taken off, apart from one, lone flower two summers ago, and I long for its uniquely floral scent! Thanks for sharing the good, the bad and the promising. That what flowers seem to be to me, little symbols of hope. Hello Christina, what a nice overview of the happenings in your garden. I have to say I rarely fertilize anything, and maybe every other year I throw some alfalfa meal down at the base of my bush roses. I never fertilize the climbers-they are way too happy as it is ! 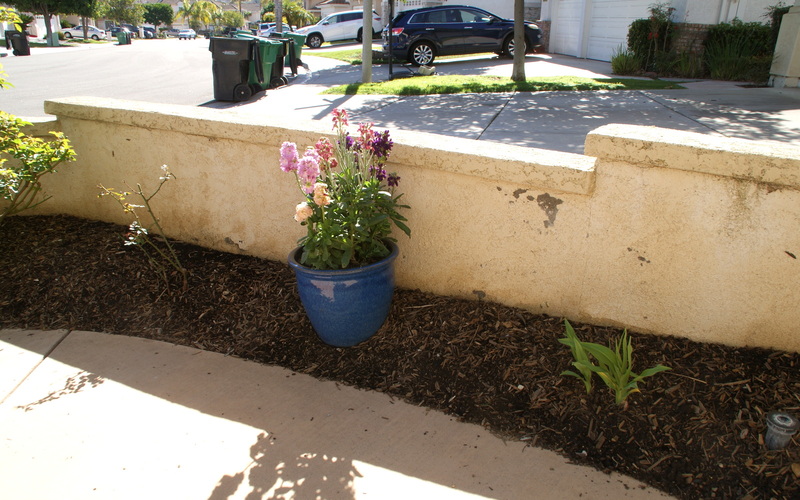 Having gardened in San Diego County for several years I know the challenges you face with the awful alkaline Co river water and hot summers.Blackspot is my demon here, and I expect this will be a bad year-more rain is coming this week. es ist schon traumhaft, wie ihr wohnt! Andere fahren so in den Urlaub. schwer es für Gärtner eigentlich ist, wenn es wenig regnet. Und euer Klima ist schon hart für Rosen. What a lovely garden and pool area. 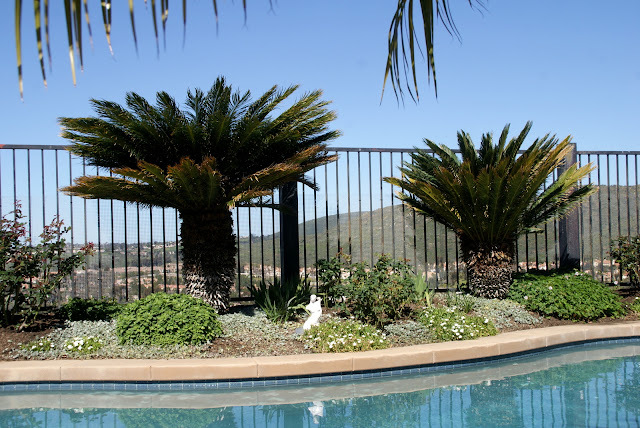 great to see pictures of your garden! I am sorry to hear that some of your roses show signs of disease. Hopefully they will do better soon, so that they will not get eliminated. It should´t be long till you can enjoy your rose´s spring flush in your climate, right? I am really looking forward to seeing all your roses bloom. Regarding your sweet peas, I also sowed sweet peas this year and now have many seedlings. Hopefully they will do fine for both of us! Love seeing these pictures! We are crossing our fingers that Mother Nature will stick to the calendar so that we can have spring longer than two days in a row. Thank you for sharing with us this week at Celebrate Your Story, have a great weekend. I love seeing your garden! I was in mine yesterday and today. Lots of trailing plants and ground covers are starting to bloom. Thinking I can do my first early spring garden post soon. Weds. I went to the estate I am helping with and we noticed that there were Peonies coming up. My friend said that she thought her Aunt did have Peony trees. We each took starts of all three. I planted them today. Probably won't do anything this year, but I love Peonies! I've gotten my roses all trimmed and now I need to fertilize them. Thanks for sharing with SYC. So pretty! We still have at least another month before we can start tackling the garden to get it ready for summer.